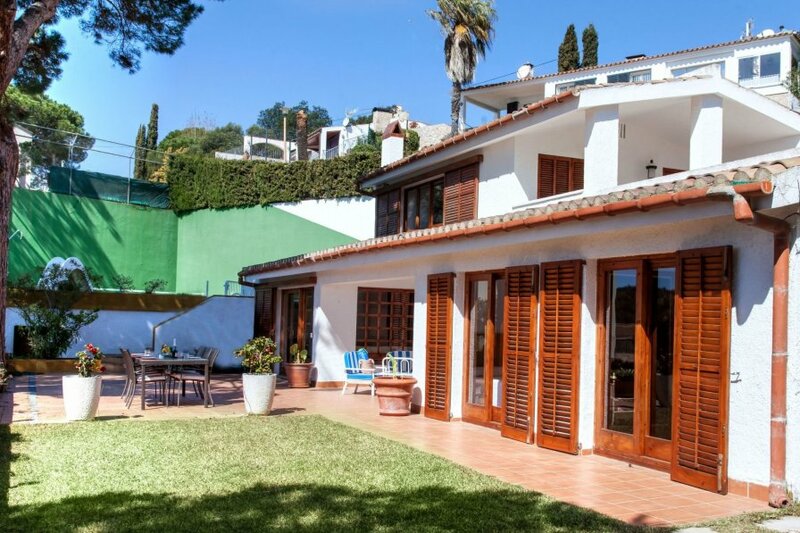 This 3-bedroom villa for up to 6 guests is located in Tossa De Mar and has a private swimming pool and. Santa Maria de Llorell 3 km from center Tossa de Mar: Beautiful, cosy, comfortable villa Amapola, surrounded by trees. In a quiet, sunny position, area with little traffic, 850 m from the sea, 850 m from the beach, south facing position. Private: beautiful, well-kept terraced garden with lawn, swimming pool angular, secured (9 x 5 m, 05.04.-10.11.). Slide, outdoor shower, patio, arbour, pergola, garden furniture, barbecue. In the house: washing machine. Parking on the premises, public parking on the road. Shop 3 km, supermarket 2.5 km, restaurant 1.5 km, railway station Blanes 15 km, sandy beach Santa Maria de Llorell 850 m. Nearby attractions: Tossa de Mar Castle 3 km, Waterworld 10 km, Marineland 15 km, Jardin Botanico Pinya de Rosa 11 km, Jardin Botanico Marimurtra 12 km. Please note: car recommended. Suitable for families. Groups of teenagers on request only. Guarded residence. The owner lives on the same property. Neighbourhood highly sensitive to noise. Quietness and good behaviour expected.